Note that the trial version is limited and displays drawings in the color orange. CadLib comes with comprehensive help documentation that integrates with the Visual Studio help system. VS 2017: by default the help viewer is not installed. To install and use the CadLib help files, first install the VS help viewer, and Set 'Help Preference' to 'Launch in Help Viewer'. See here for an howto. A stand-alone help 1 file (.chm) can be downloaded separately (the help file might need unlocking, see here). Both C# and VB sample solutions are provided. A basic viewer example is included so you can test view the DWG and DXF files you have created with the library. Also a DWG/DXF to image converter example is included and an example DWG/DXF writing program. Read, write and display AutoCAD™ DWG and DXF files in C#, VB.NET or any other .NET language. Download the trial version and get up and running in minutes. CadLib provides complete type safety, comprehensive documentation and sample solutions. CadLib's rendering is high quality and easy to integrate in your own application. Display DWG and DXF files using GDI+, WPF or OpenGL. Conversion to XAML is also supported. A high quality configurable PDF converter is included. An example console application is included (see the export example) that demonstrates the conversion from an AutoCAD DWG or DXF file to PDF. Example solutions written in C# and VB.NET show how to add more advanced features like zooming, panning and picking. Samples are included that demonstrate use with Windows Forms, WPF, OpenGL and ASP.NET 4.0. For the .NET Standard version of CadLib that can be used in .NET Core and Universal Windows, see here. Import and export DWG files (versions 13, 14, 2000, 2004, 2007, 2010, 2013 (AutoCAD™ 2013-2017), 2018). Import and export DXF files (versions 12, 13, 14, 2000, 2004, 2007, 2010, 2013 (AutoCAD™ 2013-2017), 2018). Display DWG and DXF files in Win Forms using GDI+ (2D and 3D wireframe rendering). Display DWG and DXF files using WPF (wireframe rendering). Display DWG and DXF files OpenGL (surface rendering). 100% .NET code (written in C#), compiled with the Any CPU setting. All objects are exposed as .NET classes. Convenient enums are provided for all enumerations and flags. Display a DWG or DXF file using GDI+ in a .NET Control. Display a DWG or DXF file using OpenGL in a .NET Control. 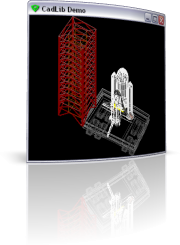 Create DWG or DXF drawings including dimensioning (engineering/architectural styles supported).